This toolkit provides an user interface to create output formats for data objects based on different output channels. So it is possible to define, which attributes of a data objects should be printed in a certain output channel. Read more about the classification store display modes. Output data configurations can be configured in an additional tab in the data object editor. 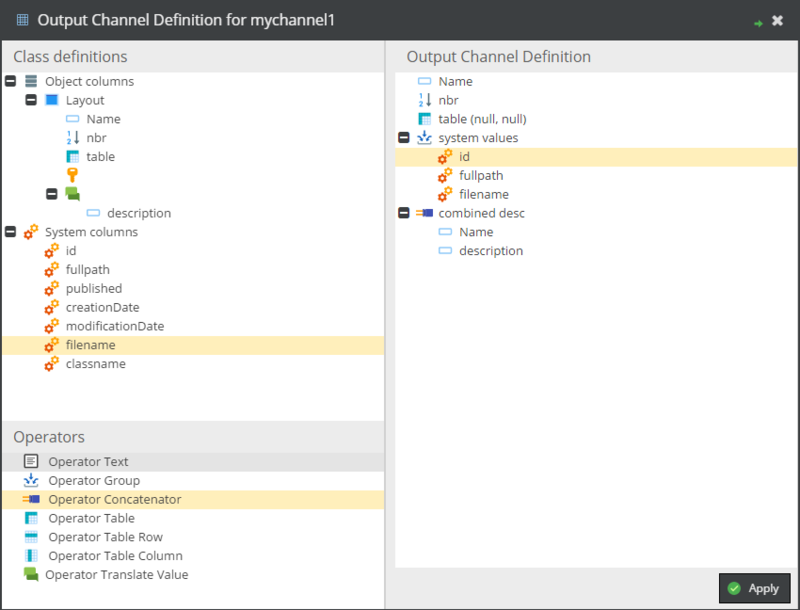 There for each data object class and output channel an output output data configuration can be defined. The output data configurations can be inherited along the data objects tree. The column Object ID shows from with data object the output data configuration is inherited from. By clicking overwrite, the editor opens and a new output data configuration can be configured. The bundle provides a service class, with converts a Pimcore data object to an output data structure based on its ouput data configuration. For defining definitions programmatically utilize the \OutputDataConfigToolkitBundle\ConfigAttribute\... classes. Change table name from plugin_outputdataconfigtoolkit_outputdefinition to bundle_outputdataconfigtoolkit_outputdefinition. Change namespace from Elements\OutputDataConfigToolkit to OutputDataConfigToolkitBundle.